Plot : + "The Hoodlum's Hero. Sponsored by: Pepsi Cola. On the trail of "Slick" Laredo, who specializes in leading young boys into a life of crime. 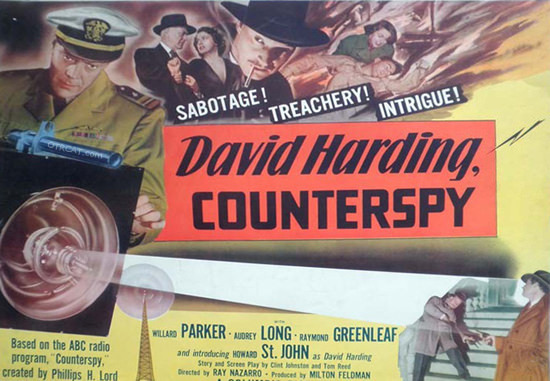 Mike Harding of Counterspies has been invited to the police headquarters to see the city’s juvenile delinquent problem first hand. They have turned the whole of the basement in to a line-up room for juvenile cases to separate them from the older and harder criminals. They discover a likely Fagin in the files, 31 year old Salvador Loreto nickname Slick has had 12 arrests and no convictions. Over half of his arrests were for contributing to delinquencies of minors such as gambling and betting in pool halls and bowling alleys. He was a former dead end kid who worked his way to the criminal top and kids that get off on the wrong foot are easily attracted to a racketeer like Loreto and were likely to make an idol of a character like him. Be the first to comment on "counterspy hoodlums hero"